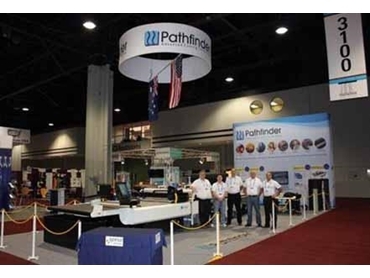 Pathfinder Australia showcased their latest automatic knife cutting technology at the Texprocess Expo 2012 in Atlanta. Pathfinder created a buzz at the exhibition with their new M-series automatic fabric cutting technology. A specially designed cutting head was fitted and painted by an artist to mark the occasion with the cutting head featuring the flags of the USA and Australia to represent the strong bond between the two nations. The new Pathfinder M-series cutters were received well by the visitors, especially those familiar with automatic knife cutting technology, as they could appreciate key benefits such as low power consumption, high productivity, ergonomics, ease of operation and reliability. Pathfinder’s ‘Manufactured with care for the Environment’ campaign struck the right chord with many participants, demonstrating that this technology can be designed to minimise the impact on the environment. The cutter’s low power consumption is a key differentiator, enabling significant savings on the power bill. Environment-friendly features also include the minimisation of non-recyclable materials in the M-series construction with 98% of the machine’s mass recyclable at the end of its lifespan. Reduced parts count also lowers energy requirement for production and transport of parts. Cutting faster with excellent cut quality reduces cutting time, further reducing power consumption.